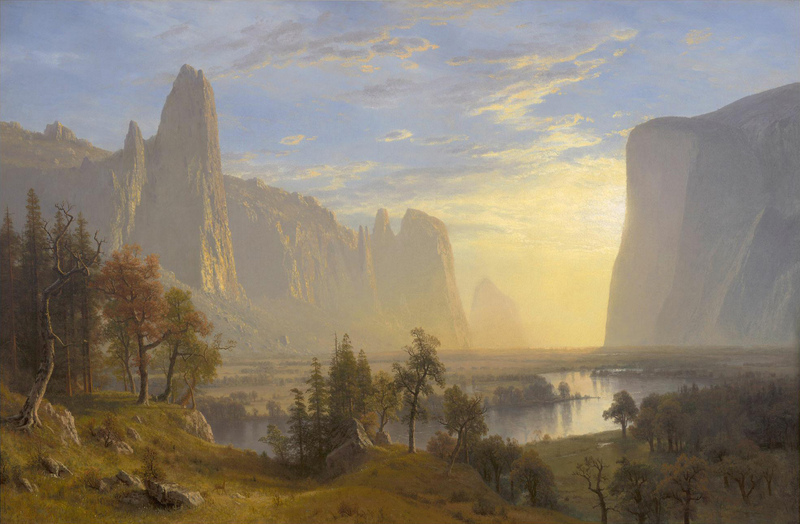 There is a line connecting Ralph Waldo Emerson’s more abstract reasoning in Nature, Frederick Law Olmsted’s requests to Congress in his Yosemite and the Mariposa Grove: A Preliminary Report, 1865, and John Muir’s popular writing as exemplified in “The Fountains and Streams of the Yosemite”. This link is more than just conjectural, too. Muir was a great admirer of Emerson. When the philosopher visited Yosemite in 1871, at the age of 68, the young Muir’s “heart throbbed as if an angel direct from heaven had alighted on the Sierran rocks” (The Life and Letters of John Muir, ch. 8; quoted in Galbraith, “Muir, Emerson and the ‘Pure Night Air’”). Olmsted also met Emerson in person and admired his Nature greatly. So much for the tangible links; the intellectual influence of Emerson is also, I think, readily apparent in the two later texts. … to a sound judgment, the most abstract truth is the most practical. Whenever a true theory appears, it will be its own evidence. Its test is, that it will explain all phenomena. Philosophically considered, the universe is composed of Nature and the Soul. Strictly speaking, therefore, all that is separate from us, all which Philosophy distinguishes as the not me, that is, both nature and art, all other men and my own body, must be ranked under this name, Nature. For Emerson, nature is not really much to do with the environment. Instead, it refers to the realm outside the Soul. The ontological status of “nature” then refers equally to one’s own body, to other people, and to “space, the air, the river, the leaf.” This helps address one of my worries from last week: namely, what is this nature we refer to when defining “geoaesthetics”? Why is this all important? Well, treating Emerson as a philosopher helps us parse his geoaesthetics. It becomes clear that his ideas about nature and about human relationships with the environment are important in at least two distinct ways. On the one hand, they had a profound influence on later American environmentalism. On the other hand (through transcendentalism and pragmatism), Emerson’s ideas had important philosophical ramifications. In particular, as I sketched above, his ideas provide serious alternative theories of truth (epistemology) and being (ontology/metaphysics). Recognizing these two distinct responses to Emerson helps us understand geoaesthetics better. Instead of providing a definition as I did last week (“an understanding of or approach to human relationships with the earth reflected in or developed through artistic practice”) I would instead propose that geoaesthetics is a heuristic that helps us understand the intimate links between four seemingly distinct areas: (1) philosophical concerns (theory of art, truth, knowledge, being, etc. ); (2) artistic practice; (3) environmental crises and social mobilization thereto; and (4) human relationships with the environment. The frivolous make themselves merry with the Ideal theory, as if its consequences were burlesque; as if it affected the stability of nature. It surely does not. … [W]e resist with indignation any hint that nature is more short-lived or mutable than spirit. The broker, the wheelwright, the carpenter, the toll-man, are much displeased at the intimation. Although he goes on to discuss Idealism more seriously, he falls short of a clear, conclusive position on the issue. As Stanley Cavell writes, Emerson has an “epistemology of moods”: “we never apprehend anything ‘straight’ or in-itself, but only under an aspect or mood.” How is this relevant? Well, Emerson is clearly not terribly invested in firm foundations that lead to clear structures. He is more interested in process, in moods, in instability. We should bear this in mind, too, even as we take Emerson seriously as a philosopher.